Chef Lancaster sources late summer’s peaches and tomatoes from local farmers markets to build this dish, which can serve as a salad or appetizer. She grills the fruit as she would veggies, infusing it with another layer of flavor. 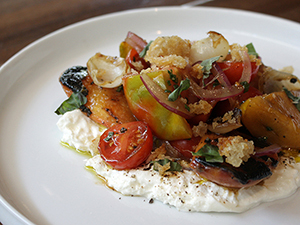 The slightly charred peaches and tomatoes contrast in taste and texture with the creamy burrata and crisp croutons. 1. Preheat grill. Wash and dry tomatoes; cut into quarters and place in large bowl. Combine ¾ cup olive oil, balsamic vinegar and honey; whisk to blend well. Pour over tomatoes in bowl; add chopped red onions and chives. Set aside to marinate. 2. Meanwhile, wash and dry peaches; cut into quarters and place in another bowl. Whisk together ½ cup olive oil with salt and pepper to taste; pour over peaches. Let stand 15 minutes. 3. Drain peaches and cook on hot grill until they are slightly charred and tender. Set aside. 4. Wash, dry, and cut off ends of pearl onions. Cut in half and marinate with ¼ cup olive oil, salt and pepper. Toss on grill or in sauté pan; cook face-down until slightly charred and tender. Set aside. 5. In saute pan over medium heat, heat canola oil. Slowly start adding pieces of ciabatta; cook over low heat until bread starts to crisp. When crispy, stir in garlic cloves, thyme sprigs and butter. Cook until garlic and bread are golden brown. 6. To serve, place burrata on bottom of small dish; top with tomatoes, arranging them in the center. Arrange grilled peaches around tomatoes. Garnish with crispy torn bread and basil.